Thinking of entering into a wine / beer show ? then read on, the following will prevent your wines / beers losing precious points or disqualification for not being as they should be in the judging guideline's. 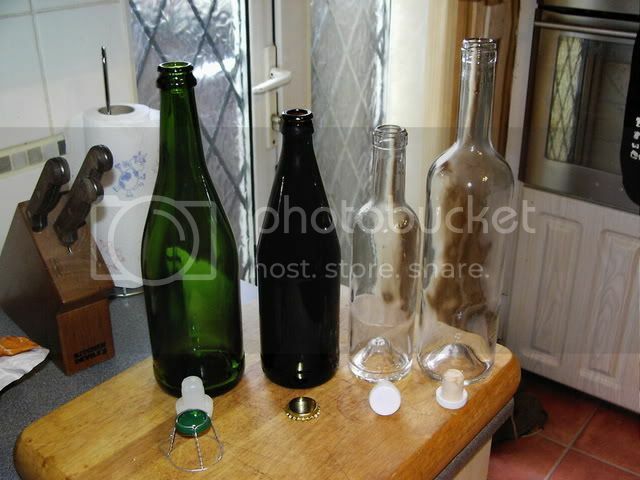 Above are examples of entry bottles, from left to right we have a sparkling wine bottle, a dark 1 pint beer bottle, a 375ml clear liqueur bottle and a 750ml sauterne style wine bottle. These must be pressure resistant capable of taking the plastic stoppers and green topped wire cages. They need to be dark green in colour and weigh when full no less than 1.6 kg, as some sparkling wine bottles such as Asti Spumante are not suitable for the shows and will be rejected after weighing. They need to be filled to between 1 & 2 inches (2 to 4 cm) below the stopper. These must also be of a reusable 1 pint pressure bottle, dark green or brown in colour and fitted with a gold coloured crown cap, do not use different coloured caps as they will be rejected. Beers need to be filled to approx 1/2 inch (1 cm) below the cap. These need to be of a 375ml size bottle, clear and fitted with a white plastic flanged cork. They need to be filled to between 1/4 and 3/4 inches ( 0.75 and 1.25 cm) from the base of the cork. Wine bottles should be of the sauterne style, clear and preferably with a punted base. They should be fitted with a white plastic flanged cork and be filled to between 1/4 and 3/4 (0.75 and 1.25 cm ) from the base of the cork. Always ensure your bottles are spotless inside and out, check against a light to ensure there are no traces of label gum or scratches. Fill your bottles before fitting your show labels as dribble marks are unsightly and will go against you when being marked for presentation. Always fit labels as instructed by the show organiser and try to keep them straight and neat. Ensure your wine is crystal clear, points will be lost for a hazy wine or one that drops sediment. Give your bottles a final polish to remove fingerprints etc and handle as little as possible before the show. So there we go, now it's about the wine inside, but at least you won't lose points at the start. Chairman of 5 Towns Wine & Beer Makers Circle!